Securing your wireless network is imperative there are numerous methods of attack and a vast population of wannabe attackers with an equally large number of motives for wanting to do so, from free Internet access to wishing to perform nefarious acts through your network, ensuring their own anonymity and freedom from prosecution. If you essentially offer easy access you may be held accountable for their actions! These course should introduce you to the threat your wireless network faces and what countermeasures you can introduce to protect your networks. 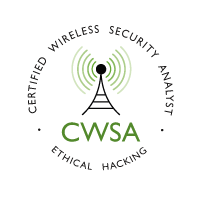 A hands on training course concentrating solely on wireless LAN security. The course progresses from attacking a basic WLAN onto implementing evermore stronger security features in order to secure the WLAN.